GBMP is a not-for-profit organization dedicated to increasing global competitiveness and employment opportunities in the Northeast United States. GBMP provides customized onsite Lean & Six Sigma training and open-to-the-public Lean & Six Sigma workshops for the manufacturing and healthcare industry. Our Lean Consulting philosophy is based on the principles of The Toyota Production System. As a licensed Shingo Institute affiliate, GBMP offers best-in-class Shingo Model™ training throughout the United States. GBMP also maintains a membership community for Lean practitioners from manufacturing, healthcare, insurance and other industries and coordinates the annual Northeast L.E.A.N. Conference. We also produce an award-winning library of Lean training materials comprised of more than 30 DVDs, including the #1 Selling Lean Training DVD in the world, "Toast Kaizen". The first steps in getting your Lean journey started with GBMP are the Operational Assessment and Top Management Briefing. 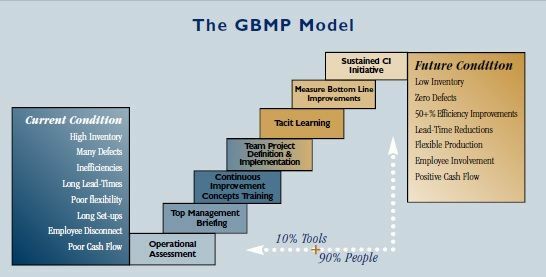 About GBMP: It is the mission of GBMP, as a not for profit, to sustain a strong and vibrant regional economy by improving the operational profitability and competitiveness of existing and emerging organizations, large and small, through training in lean and continuous improvement principles. By promoting successful implementations GBMP helps to perpetuate a positive future for industry. Our vision is to be a leading contributor in strengthening industry and increasing opportunities for employment in the Northeast United States. GBMP's values mirror those of The Toyota Production System: True North Orientation, Lean Culture, Mutual Respect, Professionalism, Collaboration and Community Service. GBMP's goal is to educate, empower and energize your people and change the way they think and work to strive to eliminate the seven forms of waste from your processes! What is Continuous Improvement? Continuous Improvement connects your employees to your customers by finding and eliminating non-value-added activities, those things the customer doesn't want to pay for, in all areas of your business. The key to success is the understanding that The Toyota Production System, Lean Culture and Continuous Improvement are all about people. Your employees are in the best position to identify and solve all the little problems that are manifested throughout your business processes. Given a little education and the proper support and encouragement, employees can find and eliminate all the headaches and time anchors that currently prevent you from delighting your customers. Continuous Improvement is about creating an environment where employees can make changes that allow them to spend more time on those things your customers do want to pay for! Take a moment to think about your facility as you read the following seven forms of waste described by The Toyota Production System. GBMP's goal is to educate, empower and energize your people and change the way they think and work to strive to eliminate the seven forms of waste from your processes!